Once again, The Benevolents (The Khmer Rouge (aka Mrs. G-LO) and Benita (aka My Better Half)) had an evening out. They said it was some sort of a fundraiser, but it sure sounded like an excuse to get all of the ladies together to go boozing. In any event, G-LO and I found ourselves once again in charge of the urchins. I may have mentioned in a previous post or two that we aren’t exactly hands-on in our approach to parenting. We see the importance of the village playing its part in raising the children. Or, at the very least, the children banding together and raising themselves (think a suburban version of Lord of the Flies). So, while the snow was falling and the boys were off watching some Marvel offering, G-LO and I sampled Cask No. 95.19 from the Scotch Malt Whisky Society. 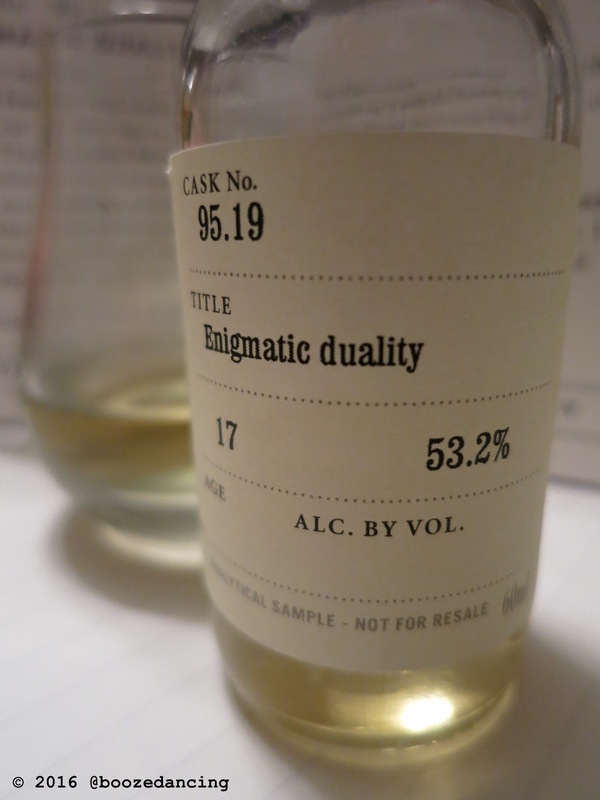 According to whiskyportal.com, Cask No. 95.19 is from the Auchroisk distillery. A Speyside distiller, Auchroisk is a relatively young distillery (built in 1972) and is a part of the Diageo Empire (cue the Darth Vader music). As a part of the empire, Auchroisk is a significant contributor to J&B Rare and Johnnie Walker Red Label. The nose appealed to us all – but in surprisingly different ways – some got tropical fruits – dried mango, kiwi, lingonberry sorbet and ‘waxed lemons in the Tuscan sun’ – others detected deeper elements of tar, seaweed and even a wisp of smoke. That enigmatic duality persisted with water – pink peppercorns, horseradish, honey, ‘lightening over herb gardens’ and toasted pistachios. The palate was immediate and powerful – mouth-coating waxed fruits, heather honey and crème brûlée wrestled with peppery heat, hints of bonfire ash and carbolic. In reduction, we found aloe vera, menthol, Fisherman’s Friends, clove, hickory and fried sage leaves – good sweet-savoury balance. Limpd: Despite the high ABV, I’m not getting as much vapor as I expected. The nose is a little grainy, a little doughy and a little nutty. I’m getting heather with a hint of tobacco and a bit of sea spray. G-LO: Surprisingly gentile nose given the ABV. Vanilla and fresh pear at the start. Also get powdered sugar, some cinnamon and eucalyptus. Limpd: Wow! The 53.2% comes roaring through! Once I push past the vapors, it is a little lemony with a big hit of coarse black pepper and a slight Slim Jimmy flavor (if that is even a thing). Think an iced lemon cookie followed by s savory smoked sausage. This all leads up to a powerful finish; though it is a little shorter than expected. Not unpleasant; just short. G-LO: Oily mouthfeel with a good bit of viscosity. Surprisingly hot at the start with a chili pepper type heat. Gets somewhat tart in the middle with a good bit of lemon zest flavors. Heats up even more at the finish with hot cinnamon, vanilla, green pear and a bit of menthol. Limpd: Wow! Again! The nose was very misleading on this one. You think you are in for something soft & gentle and then, WHAM! This was something entirely different and I liked it. G-LO: Well, this was certainly fun! A bit of a disconnect between the nose and palate, but in a surprisingly good way. Most definitely a tasty dram! Many thanks to Gabby Shayne of the Scotch Malt Whisky Society of America for providing us with this sample! We really are outstanding parents. I’m waiting for our feature interview in Family Circle. I wouldn’t hold my breath for that one.